See our list of supported 3rd Party App Integrations and how to enable them! The OCU team continuously looks to make our app compatible with 3rd-party apps from other developers which are popular among our customers. In most cases, it's embedded into the code and works right out of the box with no additional actions needed from the customer's side. For the rest of them, we've added the "Integrations" section into the Settings section to allow users to turn support on/off for those apps. Customers who place an order via OCU's checkout will receive the receipt from Conversio just as they do when using the standard Shopify checkout. Support for this application makes it possible for the OCU checkout to initiate even when the customer goes to Checkout from SMAR7 Bundle Upsell app's popup window. Support for this application makes it possible for OCU checkout to initiate even when the customer goes to Checkout through the Product Upsell app's popup window. *Note: Don’t use the "Skip Cart" feature for OCU if you use this app. The Cart page will be skipped and the popup wouldn't be shown. There's no switcher for this integration, it's built-in and works automatically. Support for this application makes it possible to redirect your customers to BOLD checkout instead of OCU checkout when a product with a subscription option is present in the Cart. There's no switcher for this integration, it's built-in and works automatically. For a deeper integration for subscriptions, please see information on our ReCharge Recurring Billing and Subscriptions app integration. *Note: Don’t use the "Skip Cart" feature for OCU if you use this app. BOLD's script will hide the "Add to Cart" button on your product pages if you've enabled the Skip Cart feature within the OCU app. Coupon Box is shown on the OCU checkout, offer and TY pages by default. To hide Coupon Box on these pages go to the Better Coupon Box app, select discount settings and click on Display Options. Support for this application makes it possible for the OneClickUpsell app to not initiate the Checkout when the OrderLogic conditions are not met. *Note: Don’t use the "Skip Cart" feature for OCU if you use this app. The Cart page will be skipped and conditions wouldn't be taken into account. Support for this application makes it possible for the OCU checkout to initiate directly from a Buy Box block on a page created using the Zipify Pages app. 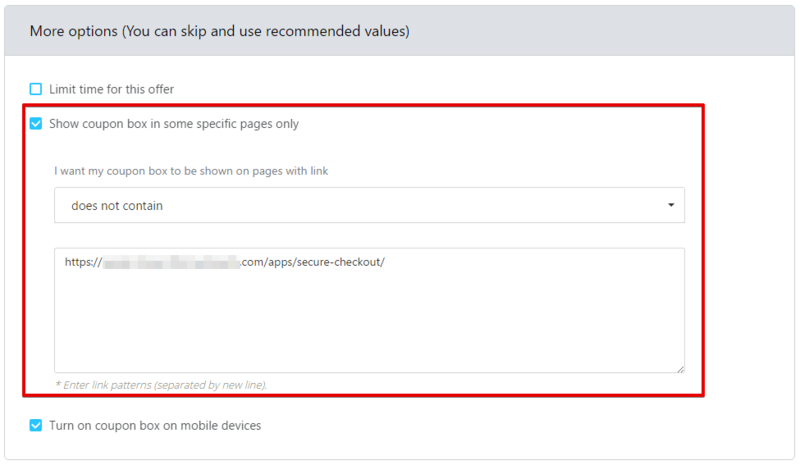 You will need to enable this integration within the Zipify Pages app at Settings > Integrations. This integration was built by the Carts Guru team using the OCU app's API. You can find their help article here. Contact the Carts Guru team for additional information and support regarding this integration. Enabling support for this application makes it possible to communicate events and checkout data from OCU's checkout and offer pages into the Trackify application. Note: This integration can only be enabled if you have an active subscription for the Trackify application. Don't add your Facebook pixel ID into OCU's settings if you're using the pixel in the Trackify app. If offer purchase(s) are taken, then it will track separate purchases - Initial and Offer(s). Each offer purchase will be tracked as a separate "Purchase" event with no distinction as to where it was displayed in the funnel (upsell/downsell). The general instructions and explanation of how Trackify fires events in upsell steps can be found in this article. Trackify always includes the total purchase value, with tax and shipping. We currently don't have an option to change that. This integration allows you to be able to either offer OCU post-purchase upsells when a customer purchases a ReCharge subscription product for the initial order or to be able to offer a ReCharge subscription option as an OCU post-purchase upsell. *Note: This integration only works if the same Stripe.com account is connected the both the OCU and ReCharge apps. More information about this integration can be found here. Don’t use the "Skip Cart" feature for OCU if you use this app and integration. The subscription product wouldn’t be added to the Cart so it wouldn't work properly. 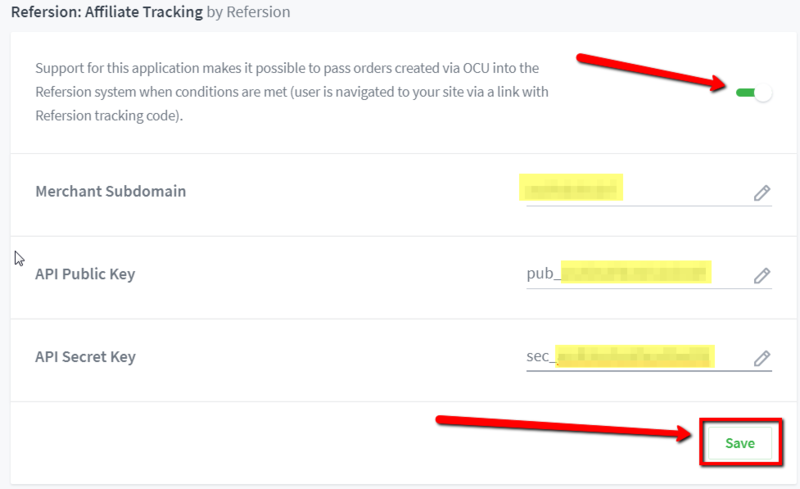 Support for this application makes it possible to pass orders created via OCU into the Refersion system when conditions are met (user is navigated to your site via a link with Refersion tracking code). To enable this integration you need to paste your Merchant Subdomain, API Public Key, API Secret Key into the according fields. To find your Merchant Subdomain go to https://www.refersion.com/base/ Account -> Settings -> Tracking. Copy Merchant Subdomain from Refersion domain link. Note: You just need your merchant subdomain name from this link as shown in the screenshot, not the entire link. For example: If your Refersion domain link is https://yourstore.refersion.com/c/abc.123 then you'd only enter "yourstore" into the "Merchant Subdomain" field within the OCU app. You can also use your store subdomain if you'd like. For example: If your store subdomain is https://yourstore.myshopify.com then you'd only enter "yourstore" into the "Merchant Subdomain" field within the OCU app. 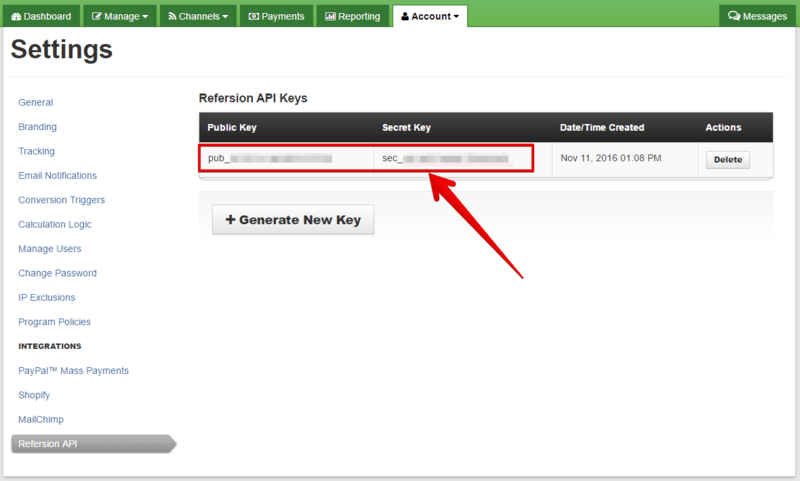 To find your Refersion API keys, go to Account -> Settings -> Refersion API. Copy your Public and Secret Keys. Paste this data and click on "Verify API Credentials" button. Check if the date is verified successfully. If verification failed you need to check this data once again or contact Refersion support. Click on "Save" button to save data. Enabling support for this application makes it possible to hide product variants created by Quantity Breaks on the OCU offer pages. It's needed because the customer can only buy 1 item on the offer page. When enabled, you should only see the 1+ variant on the offer page (not any of the others shown in your product page screen). Unfortunately, we are unable to remove the 1+ variant from showing because of the implementation of the Bold app. It creates these hidden variants and we are unable to find them in order to suppress them in the OCU app. So unfortunately, that will show there! But the product and pricing will work properly. *Note: Don’t use the "Skip Cart" feature for OCU if you use this app. The Cart page will be skipped and the product variant wouldn't be changed in the cart. Enabling this support will allow FBA to work properly for orders that contain post-purchase upsell/downsell offers that are the same as the initial order items. So for users who have the option "Enable ability to upsell a product that is already in shopping cart" set to Allow, FBA will now work properly for such orders. *Note: When this support is turned on it will merge like items together into a single line item prior to importing to your Shopify Orders section which will allow for FBA to work properly. Discounts can be applied to the post-purchase offers using the OCU app's built-in discount setting and the items will still be combined into a single line item prior to importing to your Shopify Orders area. In the case of discounts applied to the post-purchase offers, the price per unit will be calculated as the total price for all units divided by the number of units. Enabling support for this application makes it possible to communicate events and checkout data from the OCU checkout and offer pages into the Pixel Perfect application. Note: this integration can only be enabled if you have an active subscription for the Pixel Perfect application. You will also need to enable this integration within the Pixel Perfect app's Integrations Setting. Enabling support for this application makes it possible to hide special product variants on the OCU offer page from customers who have no special tag. *Note: The integration with Custom Pricing only works for Variant Dependent Method and not for Standard Method. Enabling support for this application makes it possible to work with additional product options (created with Product Options app) on the OCU offer pages. *Note: The current implementation only supports the Basic plan of Product Options. You can still use it for Premium Plan but only if you have no options with an added price there, otherwise option(s) and price(s) will be ignored and not included into the final product price. If you find your tracking code in the HTML, you're done! Enabling support for this application makes it possible to work with additional product options (created through Infinite Options) on the OCU offer pages. Note: The additional options will only show on the Live offer page(s). They will not show in offer page Preview mode. Enabling support for this application makes it possible to show Profit Pal's popup banner on the Thank You Page of OneClickUpsell. When the integration is enabled, we pull the Profit Pal script pasted on your Shopify TY page and load it on the OCU TY page. Enabling support for this application makes it possible to work with additional product options (created with Product Customizer) on the OCU offer pages. The current implementation only supports the Basic version of Product Customizer. You can still use it for Product Customizer Plus but only if you have no options with an added price there, otherwise option(s) and price(s) will be ignored and not included in the final product price. The "Photo Upload" option does not work on the upsell offer pages. It will work to pass the photo uploaded to the product for the initial checkout order only.